The Dodgers flew into St. Louis to begin a crucial four game series on Thursday night still riding high after their incredible accomplishment of winning a single game against the lowly Cincinnati Reds. Certainly that was a crowning achievement for them, but they face a daunting task with this long series against the team they are chasing in the National League wild card race, the Cardinals. The Dodgers played matchups again in the series opener placing all of the right handed bats in the lineup against left hander Austin Gomber. However this time the Dodger bats were productive. The boys in blue scored nine runs on 16 hits while going 5 for 10 with runners in scoring position. Manny Machado was 3 for 4 with three runs batted in, including a solo home run in the seventh inning. He also scored twice. Chris Taylor, Enrique Hernandez, Matt Kemp and even Austin Barnes all had two hits each, as the Dodgers knocked off the Cardinals 9-7. The win moved them to just a single game back of the Cardinals for the second wild card. Since Colorado defeated the spiraling Dbacks, the Dodgers remain 1.5 games behind in the National League West race. They needed every single run though. The Dodger pitching staff did their absolute best to keep the Cardinals in the game and very nearly blew what should have been an easy win. 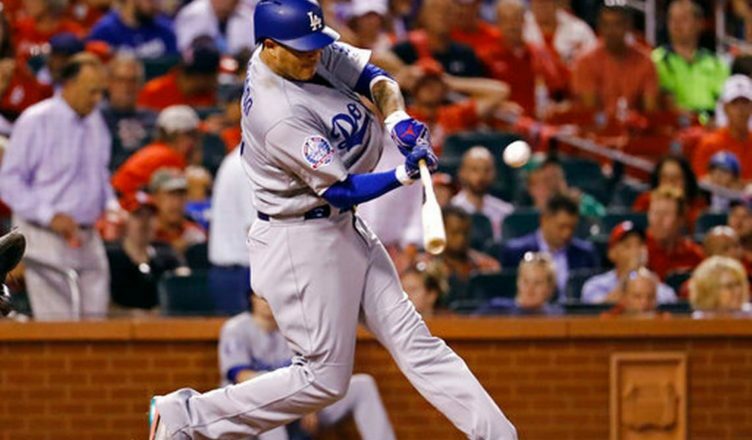 The Cardinals scored six runs over the final four innings as the Dodgers barely hung on for a 9-7 win. Hey, a win is a win right? Who’s complaining? The Dodgers started the game with singles from Taylor, and Machado in the top of the first. Former Cardinal’s World Series MVP David Freese received a standing ovation which followed by a 14-pitch at-bat and a two-run triple to put the Dodgers up 2-0. Matt Kemp’s RBI single made the score 3-0. Clayton Kershaw was anything but his vintage self, but he did the best he could with what he had. The Cards pushed across a run in the bottom of the first when Matt Carpenter singled, Yairo Munoz doubled and Marcell Ozuna’s ground out scored Carpenter. The Dodgers added a run in the third and three more in the top of the fourth. Justin Turner and Machado knocked consecutive doubles in the third. Three straight singles from Hernandez, Barnes and Kershaw scored another to put the Dodgers ahead 5-1. Back-to-back sacrifice flies from Turner and Machado made the score 7-1 Dodgers. That chased Gomber from the game. The southpaw allowed seven earned runs on nine hits over three innings. The bottom of the fifth nearly killed the Dodgers and Kershaw. Tyson Ross (who came in to relieve Gomber) bizarrely homered off of Kershaw to lead-off the inning. The rest of the inning saw the Cardinals get some cheap singles and take advantage of some poor Dodger defense. Carpenter’s swinging bunt single, Munoz’s ground ball single and a Freese fielding error setup an RBI single from Ozuna, and a sacrifice fly from Paul Dejong. Score: Dodgers 8 Cardinals 4. Overall Kershaw tossed six innings allowing four runs (three earned) on eight hits while striking out eight. The Dodgers added another run in the top of the seventh when Machado bombed one out for his 34 homer of the year, and the Dodgers took a 9-4 lead. Now you would think the Dodgers would coast through the rest of the game with a five-run lead right? Oh you would be so wrong. The Cards plated another run in the bottom of the seventh when Ozuna doubled and Dejong singled him home. It could have been far worse had DeJong not gotten thrown out at third on Jedd Gyorko’s single to left. Thank you CT3! Fast forward to the bottom of the ninth with the Dodgers still leading 9-5. Kenley Jansen took the mound and began to allow base runners. A lead-off walk to Munoz. A single to Jose Martinez put two on with nobody out. Kenley then got Ozuna to pop out. But DeJong walks to load the bases. Gyorko’s grounder to short should have been an easy game ending double play, but after getting the force at second, Machado’s lazy throw sails wide of first base as two runs score. Dodgers 9 Cardinals 7. With two outs, the Dodger’s lead is down to two runs. Thankfully Matt Adams grounds out to end the game and the Dodgers hang on to win it 9-7. With the victory, the Dodgers have their 80th win of the season. The series continues on Friday night as Walker Buehler gets the call. The Cardinals will counter with Jack Flaherty. First pitch is scheduled for 5:15 PM PST. This was a roller coaster. I like out bats heating up but this will be a tough series to pull out on the road. Dodgers should have run away with this game, but a win is a win, I guess. Kershaw not in top form (again), but manages 6 innings. Jansen nowhere near where he has to be to be effective in October. Offense finally does something, but still barely enough runs with this mediocre pitching staff. Dodgers are still wiggling like a worm on a hook. As the Rocks refuse to lose, the Dodgers must know that they have to take care of their own business to hopefully nab the last wild card ticket. Stop scoreboard watching, and Just Win. Only 15 games left… 15 very tough games. Don’t expect to moonwalk into the playoffs, Dodgers. It would be nice for them to make the playoffs, but on the other hand, I don’t know if I can bare to watch them get spanked in the playoffs again. Well Scott, Machado’s throw in the 9th was not lazy, if anything he threw it too hard and rushed the throw. But it should not have come to that anyway. Jansen was wild and all over the place. His control was definitely off. And to complicate matters, he made way too many pitches and probably will not be available tomorrow. My question is why in the hell did Roberts use him when it was not necessary. Baez was up and warm and with a 4 run lead, he should have been the obvious choice. Jansen has struggled in non save situations, and the Cardinals owned him in LA last month. But they got the W and that’s the important thing since the Rockies kept winning by beating AZ to a pulp. 80 wins. Far cry from last years 104. Boston won their 101st tonight. They should cruise past the LA win total from last year easily. According to Roberts, Stripling is replacing Wood in the starting rotation. I agree with this move. Stripling has been a far more reliable starter than Wood this season, and he still leads the team in wins along with Kersh. This is the way an offense should look. They got hits when they needed them and most came with 2 strikes. Barnes actually got a couple of knocks, and he did not really tear the cover off the ball. Belli got a hit off of a lefty, and that is encouraging. Only Dozier, who is mired in a terrible slump did not get a hit. Why Roberts keeps running his inept bat out there is a puzzle. But then again, most everything Roberts does is puzzling, like putting Jansen in a non save situation. Dumb considering his track record in those games. I think they just wanted to get him some work. He hasn’t pitched much since returning. And he missed the entire Colorado series. They have to get him regular work if they expect him to be game ready. He may never be 100% the rest of the way, but he’s better than anyone else they have. Kenley is always like he was last night, when he doesn’t pitch enough, so you are right about him having to get the work in. That is the only way he is going to get better, and have better command, although I worry about the Cards, jumping Kenley’s first pitches. I know he needs the work, but I am not so sure he is the best they have at this point. He is the closer that is for sure, but he has blown 4, 2 of them in dramatic fashion against the Cardinals in August. I just do not trust his stuff when he is over throwing like he was, and we all know he has problems when it is not a save situation. I would have used someone else. Fields, Baez, even Venditte who has been pretty good his last few outings as has Floro. Madson, I would not use that guy unless they are ahead by 10, or behind with no shot of catching up. It would have also been a good place to get Urias some work. Just saying, there were other options. Roberts bullpen choices have not exactly won any titles. 15 games left. 3 each with the Cardinals, Rockies, Padres, D-Backs and Giants. 3 winners and a couple of no shows. Going to be interesting to see how this team responds to the pressure of their first real pennant race in a few years. Their closest race in the last 5 years was 2016 when they finished 4 games in front. They had an 8 game lead that dwindled over the last couple of weeks to what it was at the end of the season. Twice they have won the division by 11 games. Last season, and in 2012, the first year of their run when they only won 92 games. I know one thing for sure, it will be nerve wracking on the fans. Personally, I would rather see them win the division than get in via the wild card. Two reasons, 1. It means you have to use your best pitcher in that game, which means in a 5 game series, you only get to use him once if you make it that far, and 2. You have to play the best team in your league if you are lucky enough to win. Right now, that’s the Cubs. The Rockies have 16 games left. That .5 will be made up on the 27th of the month. That’s when Colorado plays that extra game. One good thing tonight, Machado actually looked like the hitter they traded for. He still looks like the game comes very easy for him. He is always grinning and I never have really seen his game face…unlike Grandal who scowls all the time…..
Last regular season, you could definitely say “no lead was safe”. You just had the feeling that no matter how far behind, the Dodgers were capable of coming back and winning the game. 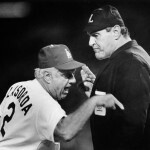 This season, I definitely can say “no lead is safe”, the Dodgers are capable of blowing any lead, no matter the amount. We played a really good game offensively last night, because most of the line up did all the right things, to get runs in. But we didn’t have a single leftie in that line up, along with Puig. And our lefties are the hitters, that tend to strike out to much, along with Taylor, so it is going to be a lot harder for our leftie line up, to mimic what our rightie line up did, last night. And we never know what we will get from Puig, from game to game too. One night he is patient at the plate, and the next night, he might swing at a bad pitch when runners are in scoring position, and strike out. Tonight might be different, because I believe we are facing the Card’s best starter, tonight. But if they can play that well as a team, on offense, we have a much better shot. But of course I am a little skeptical, because of what we have done most of the season, and this team is not consistent, from series to series. We tend to play up or down, to our competition. And we have both the Padres and the Giants on our schedule still, and we know if the Giants would knock us out, that will be the Giant’s World Series, this year. So we will need a good lead, before playing the Giants. Well, another game where Kemp sits. The last 3 of 4 are without Kemp. He was 2 for 4 last night so I guess Dummy thought he needed to rest a game or 2. If the Dodgers don’t win the West, I contend it is because of these crappy lineups and not paying attention to what has been achieved by certain players instead of what Dummy thinks they should do. He acts like they have a big cushion and he is just waiting on the postseason. HE NEEDS TO PLAY THE BEST 8 POSITION PLAYERS AVAILABLE EVERYDAY AND INTO THE POST SEASON. He will not because he is a Dummy. Although some will disagree and make excuses for him I just say. TOO FRIGGEN BAD!!!! DUMMY NEEDS TO BE FIRED IMMEDIATELY! !